TALUQAN, Afghanistan, May 4 (Xinhua) — Around 60 students of a girl school were mysteriously poisoned in Rustaq district of northern Afghanistan’s Takhar province on Wednesday, a police spokesman in the province said. “Some 60 students of grade seven to 12 of Mir Mulai Girl School in Rustaq district were mysteriously poisoned today at around 10:00 a.m. and have been taken to hospital for medical treatment,” Abdul Khalil Asir told Xinhua. Investigation has been initiated to determine the reason for the problem, the official added. 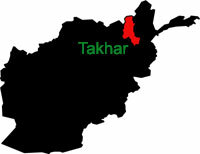 This is the second incident of its kind in Takhar province over the past two weeks. In the previous incident, which happened in the same district Rustaq on April 19, a total of 62 students of a girl school were poisoned and the vommiting caused them to fall unconscious for several hours. The puppet government must IMMEDIATELY LAUNCH A SETIOUS INVESTIGATION to find out whether who is commiting these types of heinous crimes against innocent school children. The sophistication and controlled execution of these locally unprecedented crimes are clearly pinpointing links to foreign infiltrators. They must have obvious STRONG connections to imposing and bullying THUGS AND THUGMARS and their foreign-supported associates. STOP THE CRIMINSL THUGS AND THUGMARS !